Fr. Ignatius did his study on a sample of 300 Navajeevan Children at Vijayawada under the guidance of his Research Supervisor and Guide Prof. Chandraiah Kotta of Sri Venkateswara University, Thirupathi. 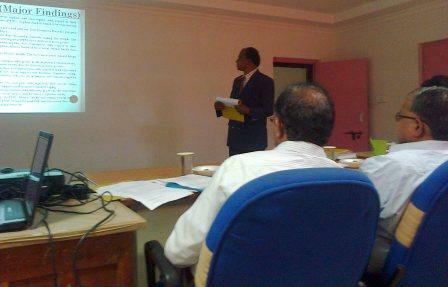 He defended his doctoral thesis at the Department of Distance Education, Acharya Nagarjuna University, Guntur. The defense was an enlightening experience. A team of five professors examined the Research Scholar. After he presented the synopsis, each of the professors sought clarifications and raised questions. From the discussion we could understand that he had done a quantitative research on the subject of abuse and how abused children could be helped through counselling. The Researcher made important proposals that could be followed by the government as well as the public interested in children and working with abused children or preventing abuse of children. At the end of the defence, the head of the team, the Director of the Department of Distance Education, gathered the approval of all the five examiners and congratulated Fr. Ignatius for his successful defence. They started referring to him as Dr. (Fr.) Ignatius Peyyala. Incidentally, this is the second doctorate procured by Fr. Ignatius.